Bob Tisdale has a post at WUWT comparing sea surface temperature trends predicted by a mean of IPCC models versus HADISST observed trends. He notes that the 17 year (204 month) trends do not agree very well. Update - I've added an appendix showing how the all-trend plot can be used to understand the arithmetic behind the current drop in 17-year trend. 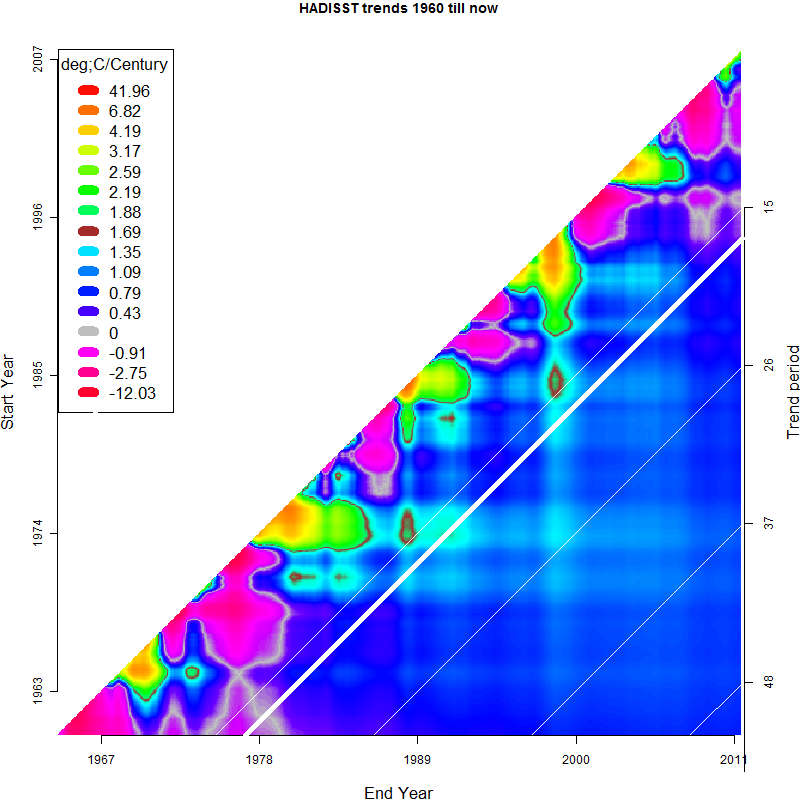 Tamino pointed out that the model mean that Bob used had far less variability than individual model runs, and could not be expected at all to reproduce the decadal variation of observations. 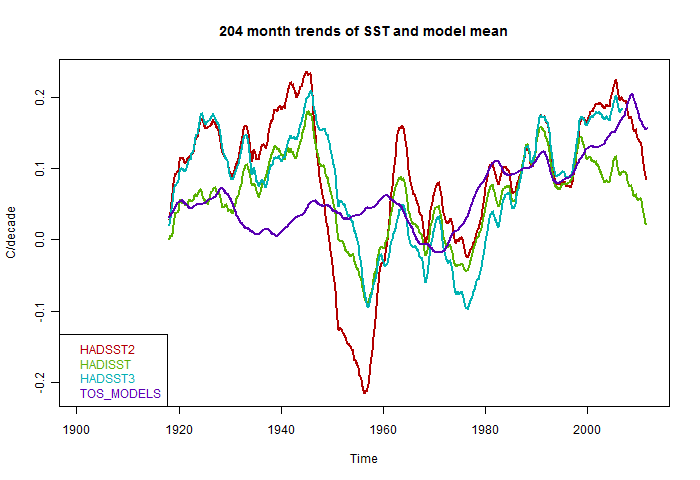 You can see some of this in the following plot, which includes two other SST measures, HADSST2 and HADSST3 in the mix. These of course are far more interdependent than model runs, but you can already see that the model mean is within the variation of the observations, with the exception of an oscillation between about 1930 and 1960. I'm interested in this, because I have been writing a series of posts here, here. and here, which try to give a wider view of how calculated trends are part of a larger picture, which can indicate whether the choice is special in some way. To see decadal trend variation in greater breadth, I made an interactive plot similar to the one described here. It's below the jump. 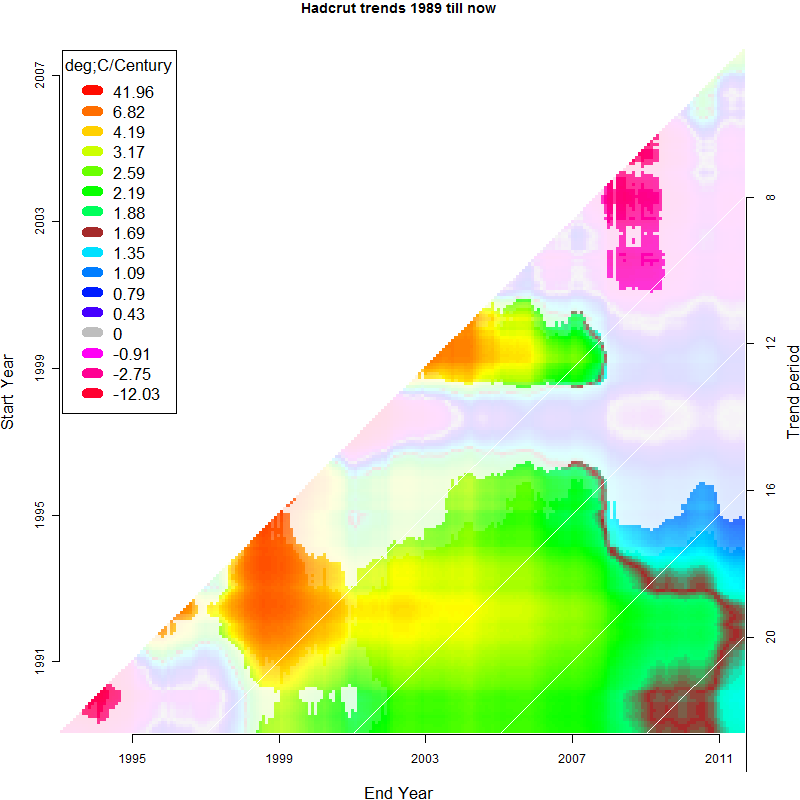 This color plot shows all the trends that you could have created over the period since 1901, over periods greater than 4 years. The white diagonal lines are tracks of constant trend period, shown on the right axis, and you can estimate the 17-year line and follow it to see how it behaves, as indicated in the plots above. Then you can look at nearby trend periods. You can click on this plot to move the red and blue balls on the plot on the right. There are also controls on the plot - the red and blue bars, and the "nudgers", marke dwith <<<<>>>>. The purple one of these is particularly useful, because if you have set the interval to 17 years (or 30, or whatever), then it moves the balls preserving this interval. Then you can see how the trends are responding to the various features of the plot. Every time you create a trend, the numerical result is written below the graph. One thing that stands out is the big peak in 1998. That's the reason for the current decline in trend in HADISST particularly, but also visible in HADSST2. It is a deviation from the models, because they do not hindcast such features. The present drop in trend reflects the fact that the peak is nearly 17 years ago, and is reaching its maximum leverage in the trend. That is more influential than the current observations. Appendix - further explanation of the 204-month trend effects. Here is one of the still plots from the interactive gadget. It is for HADISST, focussing on effects since 1960. I've emphasised the white line corresponding to 17-year trends. In Bob Tisdale's Fig 3 represents the transect along this line. But we can learn more from the full picture. It's a mass of colors, but horizontal and vertical bar effects are a feature. These correspond to unusual years, and 1998 is a big one. There is a vertical bar of warming trend, for trend periods which lag 1998. Having a warm year at the "future" end of the trend period augments the trend. But if it is at the other end, it has a negative effect, and you see this with the horizontal bar. Bob made mention of the current dip in HADISST. With this plot, you can see what is influencing that. It's close to the big horizontal bar from 1998, which lowers the trend. And it's close to the vertical bar from 2008/9, which also lowers the trend. There's a small increment from current cooling. The plot gives you a feel for how these add together. 1998 is dominant. If you move down to the 30-year trend, as Bob showed, there is very little recent dip. The reason is that we've moved away from the 1998 horizontal, but not from the 2008 vertical. The scientific damper to choice of trends in a noisy signal is the significance test. So I've adapted the figures to show significance. I'm using the device of transparency - the colors just fade away as significance is lost. There is a small change at 99%, a big drop at 95% and a small further fade at 90%. The small changes are hard to see. The test is whether the trend is significantly different from zero. Colors fade when either the period is short or the estimated trend is in fact close to zero. 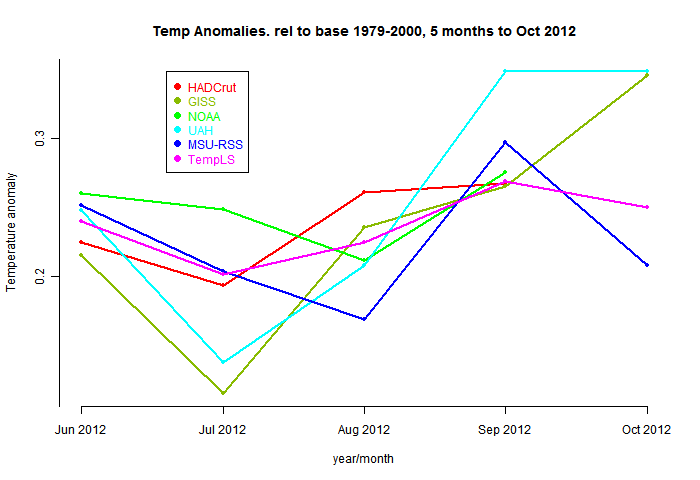 The data here are monthly temperature anomalies, so there is correlation, which affects significance. I've used the Quenouille correction for loss of dof. It gives results very close to AR(1) modelling. I'll give details. I have included two new series - the NOAA land only index and the HADSST2 sea surface temperature. You can choose the series and time intervals by using the radio buttons on the right. I have redesigned the plot to make full use of the screen space. Because it overwrites the sidebars, I'll keep it below the jump. So here is the plot. On the left, each small colored square represents a temperature, and the legend gives the center of each color range. I'm using more colors to give a more continuous gradation. But again, the colors have a gray band near zero and a brown band at about 1.7 C/century, a roughly typical figure for end 20C. If in doubt, just click a region - the numerical value will appear on the right, and the blue and red balls will jump to mark the endpoints of the trend line. You can also control the range from the graph at the right. You can click on the red and blue lines to move the corresponding balls to that position. There are also the nudge controls; the red and blue ones control the corresponding balls. The further from the center you click, the bigger the jumps. I have added two other nudgers. The reason is that I found it quite informative to make a kind of movie by moving the range along by clicking. The purple nudger, top right, moves both balls keeping the separation constant, so you can see, say, how a 10-year trend varies. The gold one moves them apart, but keeps the mean constant. This lets you see if there is any kind of derivative at a point that makes sense. I'll discuss in detail the color plot for Hadcrut3 for the period from 1989. The reason is the famous question that was asked of Phil Jones as to whether there had been significant warming since 1995. Presumably someone had worked out that that was about as far back as you could go before warming became significant. Anyway, PJ said no, and of course there was then much chatter of "no warming since 1995". But then later he said that it had become significant, and was criticised for changing his mind. But you can see from the plot here what is happening. If you follow up the right vertical axis (now), the numbers mark the period of trend. Start 1995 is now nearly 17 years ago, and that is indeed the boundary of significance relative to zero trend. You can follow the white diagonal line to see other recent periods with 16 years of trend. They are all significant, generally with a greater warming trend. So "since 1995" is borderline significant partly because it is a fairly short period, but also because among such periods, the estimated slope, though positive and only a little below the recent average (brown, was small enough to tip the balance. Conversely, there are periods even on the four year boundary where the estimated trend was different enough from zero to be significant. These tend to associate with unusual years. 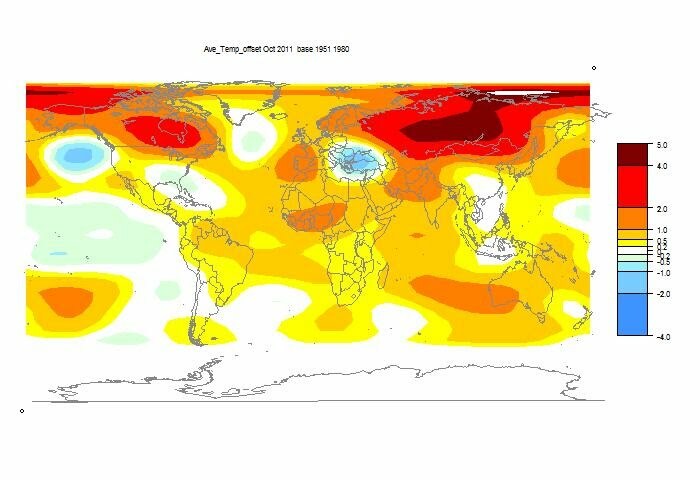 2003 and 2005 were warm, so there is a period where short-term warming was significant, while 2008-9 was cold, and significant cooling could be observed. There is also a patch of significant cooling bottom left about the time of Pinatubo. Calculating significance Just a word on how the significance was calculated. Calculation time is important. There are about 5 million dots on these plots, and each one represents a regression over up to a thousand data points. So you can't just use a standard regression package (unless you are blest with much greater patience than I am). Fortunately you can do simple regressions by just working on a few vectors of cumulated sums, so instead of a sum of many you work with just a few differences of two. But that complicates the programming. In fact, S=(X*X)-1σ2 is the covariance matrix of (a,b), where σ is the variance of the residuals d=(y-aJ-bI). σ2 is estimated by s2=(d*d)/(n-1), so the standard error of the trend a becomes sqrt(S11s2). That assumes the residuals are independent, ie not correlated. But for monthly anomalies this is not generally true. Effectively the se is larger, and the Quenouille correction is to multiply the se by sqrt((1+ρ)/(1-ρ)) where the correlation ρ = Σ (dtdt-1)/(n-2)/s2. The numbers of months (dof) are large enough (min 48) that the t-distribution reduces to normal reduces to normal, so I used the conventional 2-sided se measures (abs(trend)/se>1.96 = 95% etc).